Loved the guest stars. Loved the work of the cast, with one blameless exception. Loved the concept of Chuck being captured. Loved Sarah’s reaction to Chuck’s capture. Loved Casey and Morgan teaming up with Sarah to go find Chuck. Loved the action sequences. Disappointed with the story narrative. It is a given within the Chuckverse that fans have to relax their suspension of disbelief. We do it every week because the payoff is often worth it in terms of character moments and entertainment value. Each of us has our own subjective tipping point where the strain on credibility exceeds that disbelief threshold and disarms the entertainment payoff. For myself it revolves around whether or not the story beats being carried off feel honest to the characters or characters are made stupid to support the storyline. In this episode we have Chuck unable to flash. In essence, an injured field agent with an indeterminate recovery period. So the notion that sending him in the field so injured, with minimal support, and gamble on the Pure Fear of Death restoring his flashing ability makes no sense. Even within the Chuckverse. 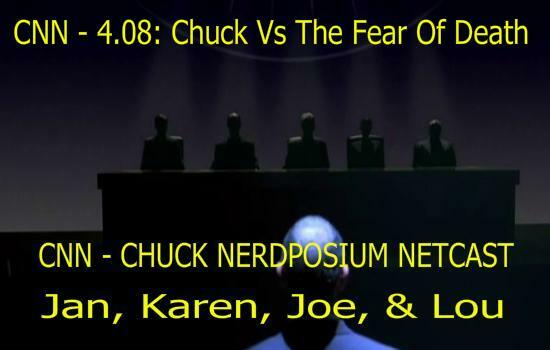 This episode also reopens the series old question as to why Chuck is not being given traditional field training as a backup or supplement to his Intersect abilities. It is illogical to put Chuck, a very unique and very valuable resource; an All Star if you will, in actual mortal danger. Beyond transparent dramatic ones. It is akin to sending a star injured baseball player out onto the outfield with a broken catching arm and telling him to perform the same duties with his other arm. Without a catching glove. It also makes General Beckman incompetent and makes her a transparent story device; harming the character in the process. There are many less credibility straining story lines to get Chuck to a position where he ends up captured. Could not the same result been achieved by duping Chuck into thinking he was on a real mission instead as one example? Throw all these factors together and for me that suspension of disbelief tipping point is exceeded. If you were able to accept the storyline then obviously this episode will work much better for you. What was really interesting about the episode was that the diagnosis for Chuck’s inability to flash seems to be a false one. That false assumption being that whatever the MamaB PSP Intersect Upgrade did to Chuck has suppressed the Intersect. Laboratory methods fail to work so Agent Rye’s Pure Fear of Death hypothesis is given a go. By now questions about Chuck’s character in terms of bravery and self-confidence have been answered several times over. So further exploration of these themes is redundant. Especially if the flashing problem turns out to simply a technical one. It may just be a matter of software incompatibility between Intersect 2.0, which PapaB did not work on, and the PSP update. Based on what we saw in this episode it seems most probable that the suppression theory of the Intersect is wrong. Chuck faced multiple moments of danger but still was unable to flash. PFOD as Intersect Cure? Don’t Think So! Star Trek Neck Nerve Pinch Reference! ‘Did I just get shot?’ Bye, bye, Rye. Casey and Morgan telling Sarah ‘We’ll go together,’ to find Chuck. Great family moment. Full marks to the cast, and guest stars, for doing yeoman’s work with the material. Yvonne Strahovski continues to nail it, week in and week out. Adam Baldwin has been a rock all season even while being under-utilized to an extent. The guest stars were fun and Richard Chamberlain’s brief turn in this one sets him up nicely as a force to be feared and reckoned with in the next one. Summer Glau was fun to watch too even if the amount of screen time and storyline of the BuyMore took away precious screen time that could have been better used in the main storyline. With Jeff and Lester cluing into the constant succession of Gretas, does this spell the end of the Greta concept? Robert Riggle was a hoot as a manic version of Crocodile Hunter mixed with Dr. Phil. His over the top zest for being a spy was entertaining to watch and his character will be missed. Too bad he was not used in a sensible storyline. What saves this episode, that seems to be mostly smoke screen because everything that happened in it is based on a false assumption about the Intersect issue, is the last five minutes. Once Chuck is captured the story narrative really springs to life. Sarah has her best moments, angrily defiant to anyone that gets in her way of finding Chuck. Casey’s nonverbal reactions to her outburst spoke volumes and when he and Morgan showed up, not to confront Sarah, but to offer their aid and support; it is one of the series’s great, ‘characters as a family,’ moments. One of the story ideas fans having been waiting for awhile, Chuck or Sarah being captured for an extended length of time and being rescued by the other, is finally in play. While this episode did not generate the same level of tension and excitement that the end of Chuck Vs The Fat Lady did when Casey and Sarah thought Chuck had been captured by Jill, the promos for the next episode – Chuck Vs Phase 3 – look to fulfill, if not exceed, expectations as Sarah goes Rambo on a Chuck Rescue. 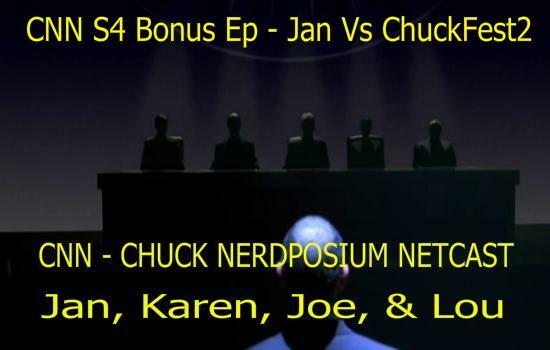 CNN Season 4 Bonus Ep – Jan Vs ChuckFest2! No episode of Chuck this week to review but instead a SPECIAL BONUS EPISODE of CNN as Jan aka happydayz3 recounts her ChuckFest2 experience.